As I'm sure you've seen by now, LSU has announced throwback uniforms to be worn in this Saturday's game vs Mississippi State. The uniforms feature an almost mustard-colored gold jersey with purple and white sleeve stripes, white pants, and a white helmet with a gold stripe and numbers, both outlined in purple. They look great, in my opinion, but the relevant thing for Mississippi State is that it opens up the uniform possibilities for Saturday. LSU traditionally wears white at home, so it was assumed the the Bulldogs would repeat one of their previous combinations (maroon over white or maroon over gray) in their trip to Baton Rouge. With LSU wearing colored (but still light) jerseys, the Bulldogs basically have free choice of uniform. LSU's jerseys are dark enough that the Bulldogs could wear white for the first time this year, but maroon would be enough contrast also. If the Bulldogs wanted to combat throwbacks with modern, they could go with black. Here we'll take a look at what a few of the more likely matchups would look like. MOST Likely: The Bulldogs take advantage of the very rare opportunity to wear white in Baton Rouge in a SEC game. If the Bulldogs do go this route, there are still plenty of different combinations that they could go with. As far as helmets go, shiny maroon, matte maroon, and white are all options. Matte is preferable, in my opinion, on the road. White would be interesting but would create a VERY light matchup as LSU is also wearing white helmets and pants. Gray and white are the known options for pants, but it's likely that new maroon pants will be worn at some point this year. Note that the helmet in the graphic is matte; a shiny helmet is also a possibility, but it's a small difference so it would be redundant to also include in the graphic. ALSO Possible: Color-on-Color matchups are fairly common in college football these days; the NFL and Nike even announced a season-long color-on-color series called COLOR RUSH today. 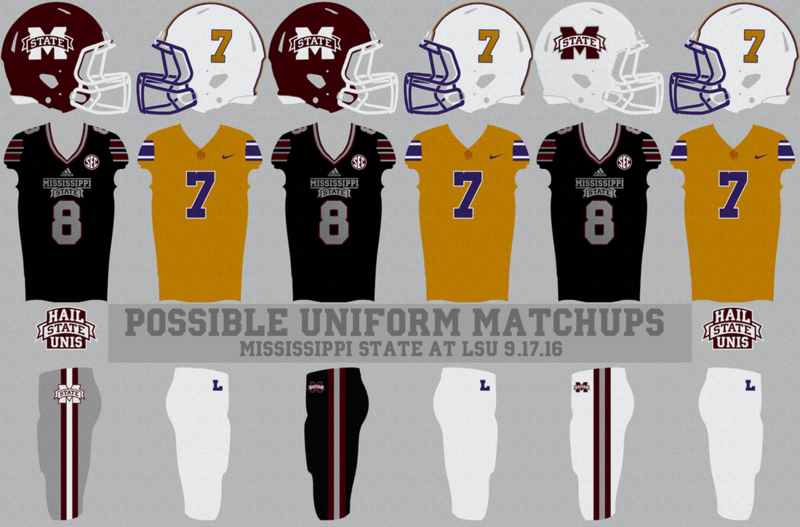 Maroon and Gold are contrasting enough; it's entirely possible that the Bulldogs wear Maroon in Baton Rouge anyway. 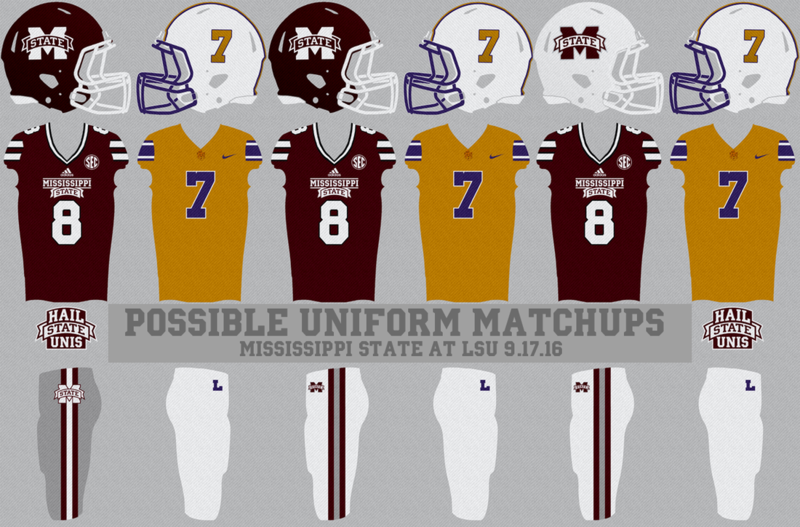 They could go White-Maroon-White to basically mirror the Tigers, or wear one of the combos from the first two weeks. Mono-maroon, with either a white or maroon helmet, would be a worst case scenario. NOT Likely, but it's happened before: In 2010, the Bulldogs wore all black in Baton Rouge against the Tigers. If they wanted to combat LSU's throwback look with something ultra-modern, this would be the thing to do. If they follow the trend of the first two weeks, the Bulldogs' uniform combo will be announced on Thursday or Friday.